Ginbot 7 Movement which is rebranded as Arbegnoch Ginbot 7 Movement for Unity and Democracy disclosed today that it will be fielding candidates in all Federal electoral districts. The are 547 electoral ridings across Ethiopia, which is divided into 9 ethnic based regional states and two city administrations. 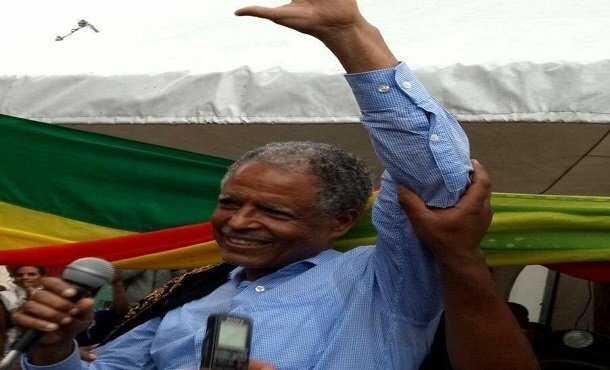 Deutsche Welle Amharic Service reported Andargachew Tsige, secretary of the movement who was released from prison in May of this year after four years in death row, spoke about it during a meeting in London with members of the movement in the United Kingdom and the region. He also said the movement is preparing to engage Ethiopians living abroad widely and that it will finalize party program and code of conduct for member. Ginbot 7 movement was one of the opposition groups that were outlawed in the country on grounds of “terrorism.” It was after the election of Prime Minister Abiy Ahmed, from within the ruling coalition, that the organization was removed from the list of terrorism and its leader Berhanu Nega, who was sentenced to death in absentia, returned home after several years in exile. If election is happening next year, Ginbot 7 will be running up against the ruling coalition, EPRDF which constitutes four ethnic based parties. Ethiopia recently appointed former opposition leader and political prisoner, Birtukan Mideksa, as chiarperson of the National Election Board with a mandate to carry out necessary institutional reform so as to make the institution credible, neutral and acceptable to all Ethiopians. Prime Minister Abiy Ahmed held a meeting with more than 81 opposition groups in the country and the next election was among agenda items. A considerable number of Ethiopians are expressing concern that the upcoming federal election, which is happening next year if not cancelled, need to be postponed in view of increasing security problems in different parts of the country. One Response to "Ginbot 7 movement to field candidates in all ridings in the next election"
Neo liberal dream! would it materialize in todays Ethiopia? only time will tale.